Intracranial injuries related to trauma, homicidal attacks, gunshot, or accidental injuries are commonly seen in emergency department. However, self-inflicted intracranial injuries are rarely described. In this report, we present a case of self-inflicted injury to the brain, by a male, under the influence of alcohol without any behavioral or cognitive sequelae. Penetrating brain injuries account for about 0.4% of head injuries and occur as a result of high velocity and gunshot trauma. Self-stabbing leading to penetrating injuries of abdomen, thorax, neck, or limbs have been widely reported. However, only few cases of self-inflicted penetrating brain injury had been reported in the literature. Stab wounds of the brain are relatively uncommon because the adult calvarium usually provides an effective barrier. We describe an unusual case of self-inflicted stab injury (identity of the patient not revealed) to the skull by a patient in the state of alcohol intoxication, who recovered without any complications. 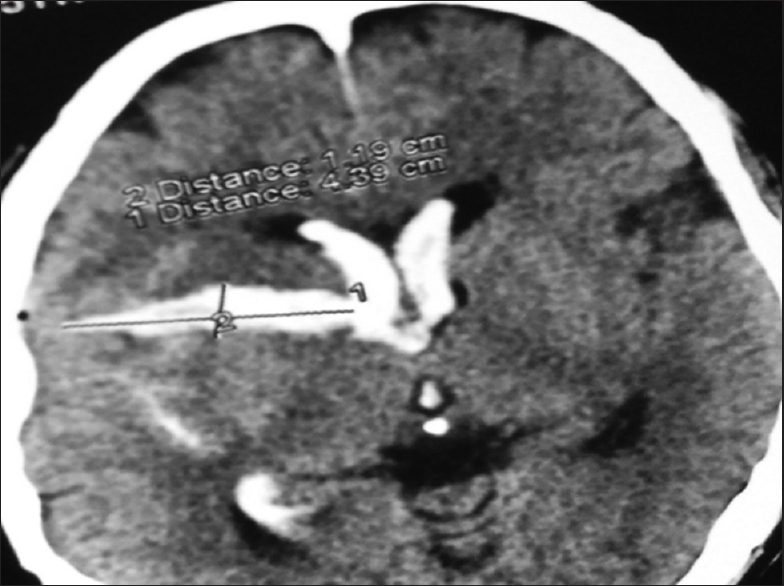 A 35-year-old male presented to the emergency with penetrating stab injury on the right side of temporal region. Exploration of the history revealed that patient had been using alcohol, opioids, and tobacco in the dependent pattern since the last 8–9 years. Over the years, there had been multiple attempts to abstain from the various substances, but he would experience relapse after few weeks to months. About 2 weeks before, the presentation to emergency, he had an episode of withdrawal seizures and was admitted to a deaddiction center. He stopped all the medications immediately after discharge and relapsed. He started consuming about 750 ml of Indian Made Foreign Liquor (Whisky) on daily basis. However, did not start taking any opioids. A day before the presentation to emergency, he consumed about 1100 ml of whisky and was intoxicated with alcohol. When he reached home in the intoxicated state as suggested by slurred speech and gait disturbance, he had an altercation with his wife. Following this, in the feat of anger, he picked up a knife of 8–10 cm blade and stabbed himself on the right temporal region. The whole knife pierced the right temporal region. Spontaneously, his mother took out the knife and he was immediately taken to a hospital where computerized tomography (CT) of brain [Figure 1] was done, which showed a penetrating wound measuring 4.39 cm × 1.19 cm in size extending from margin of the right ventricle to extradural region. Dressing of the wound was done and he was referred to our center. There was no associated history suggestive of generalized tonic–clonic seizures, intake of any other substance other than alcohol, fever, depression, panic attacks, and self-injurious behavior in the past. At the initial evaluation in the emergency, patient was conscious, oriented to time place and person. He reported craving for alcohol and mild withdrawal symptoms. Patient denied that he had any intention to harm himself. There was no history of suicidal attempt or any psychiatric disorder. At the emergency, repeat CT Head was done, which showed similar findings. His liver function test, renal function test, serum electrolytes, and electroencephalogram did not reveal any abnormality. He was managed with benzodiazepine and thiamine for alcohol withdrawal syndrome. Patient remained in the hospital for about 48 hours, remained stable, both hemodynamically as well as cognitively. His mini-mental status examination score remained more than 28 over multiple assessments. He was advised to remain abstinent from all the substances. At the time of discharge, he was advised to follow-up with the psychiatric services. Motivation enhancement therapy was planned and anti-craving agent in the form of naltrexone was started. He remained abstinent from all the substances for the next 3 months, without any cognitive (mini-mental state examination score >28) or behavioral sequalae (i.e., there was no disinhibition, uncontrolled anger, agitation, apathy, incontinence) of the stab injury. Penetrating head injuries, account for a small number of head injuries, are, usually, accidental (under influence of substance, poisoning, intoxication state, or acute stress) or homicidal, and are associated with poor outcome when compared to blunt trauma. While intentional injuries have a visible human motivation, unintentional injuries are not associated with a motivation for specific harm (e.g., traffic accidents, falls, drowning, and most poisonings). Suicidal penetrating head injuries are usually the result of high-velocity gunshot wound. Bukur et al. observed that 76% patients with self-inflicted gunshot wound had a head injury. Penetrating craniocerebral knife injuries are rare and occur almost exclusively in homicide cases or by accident. Suicidal stab leading to penetrating brain injury is an extremely unusual event. There are few case reports in the literature in which authors have described self-inflicted stab injury of the skull and brain. Fekete and Fox  described a case, who stabbed himself with a knife, which passed through the skull into the brain. The victim also had abdominal and chest stab wound and succumbed to his injuries. Penetrating brain injury poses a difficult challenge for the neurosurgeon. According to Taylor and Peter, higher incidences of complications are seen in patients with retained knife blades in the cranium as compared to those patients in whom the knife has been extracted. Complications depend on the structures that are penetrated. These include intracranial hemorrhage, major vascular injury with or without pseudoaneurysm formation, cerebrospinal fluid fistula, intracranial, and extracranial infections along the knife track, injury to eloquent cerebrum with resulting neurodeficits, brainstem, and deep brain injuries and orbital or mucosal injuries. Nathoo et al. observed that brainstem injuries occurred in 2.85% of patients with transcranial stab injuries. Fortunately, our patient only had no such complication and had only mild brain contusion along the knife track and also did not develop any intracranial infection. It is also important to remember that alcohol use, withdrawal and intoxication are also been shown to be associated with self-harming behavior including suicidal attempts and completed suicide. Accordingly, it is important to assess patients who are using substances for suicidal behaviors. However, existing literature on self-induced brain injury has not discussed this in details. This case report demonstrates that penetrating head injury can be associated with no sequelae. Further, the case also demonstrates the use of CT scans in establishing the tract of penetrating injury. Paiva WS, Saad F, Carvalhal ES, De Amorim RL, Figuereido EG, Teeixera MJ, et al. Transorbital stab penetrating brain injury. Report of a case. Ann Ital Chir 2009;80:463-5. Gerard A, de Moore G, Nielssen O, Large M. Survivors of self-inflicted stab wounds. Australas Psychiatry 2012;20:44-8. Dempsey LC, Winestock DP, Hoff JT. Stab wounds of the brain. West J Med 1977;126:1-4. Peek-Asa C, Heiden EO. Injury control: The public health approach. In: Maxey-Rosenau-Last Public Health and Preventive Medicine (Public Health and Preventive Medicine. Wallace N, editor. 15th ed. New York: McGraw Hill Medical; 2008. p. 1319-28. Bukur M, Inaba K, Barmparas G, DuBose JJ, Lam L, Branco BC, et al. Self-inflicted penetrating injuries at a Level I Trauma Center. Injury 2011;42:474-7. Fekete JF, Fox AD. Successful suicide by self-inflicted multiple stab wounds of the skull, abdomen, and chest. J Forensic Sci 1980;25:634-7. Taylor AG, Peter JC. Patients with retained transcranial knife blades: A high-risk group. J Neurosurg 1997;87:512-5. Nathoo N, Boodhoo H, Nadvi SS, Naidoo SR, Gouws E. Transcranial brainstem stab injuries: A retrospective analysis of 17 patients. Neurosurgery 2000;47:1117-22.